With the new cute pink blog I am going to try to be more positive in what I write. I have wanted to be a wife and mother for a long time. I would worry, as almost every single girl does, that I wouldn’t find “The One” and would never get to be a mother. So I came up with a back up plan in case that happened. A plan that would still fill my life with children. But God in His infinite wisdom did bring a man into my life (quite the catch too if I may say so) and so far as blessed us with two beautiful and wonderful boys. The tender moments with my children are everything that I hoped for. The snuggling in the mornings, reading to them, rocking them to sleep, making yummy treats, and having birthday parties. Being a big sister to 6 younger siblings also prepared me for the not so tender moments, the diapers, 2-year-old tantrums, and the word “NO” being tossed back in your face. 🙂 I wasn’t prepared, however, for all the crying, the neediness, the sleepless nights, the exhaustion of daily grumpy kids. I wasn’t prepared for the stress of being good parents and the pressure from other people about how you are raising your kids. And being a wife. It’s great! I love my husband. I love being home when he gets here. I love making food. I don’t even mind the laundry or cleaning the bathroom. But every now and then I have these thoughts running through my mind that aren’t very loving. And sometimes, when he asks me if I want to do something for him I answer with, “No not really, but I will.” At least I’m honest right? So along with a pink blog I am going to try to become more like Prov. 31:28. It is going to be slow going, and I’ll probably make many mistakes along the way. I’ll still get in bad moods, write complaining blogs, and be altogether miserable. But the in between times I hope to a blissful Prov. 31:28. Because that’s what I want for my husband. What I want for my children. 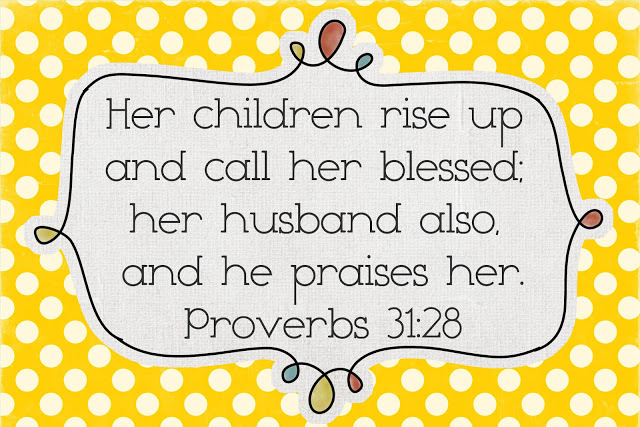 To be the kind of wife and mother that is praised and blessed. When I took on the roll of wife and mother, I took off the roll of me, mine, myself. At least for a season, however long that may be.